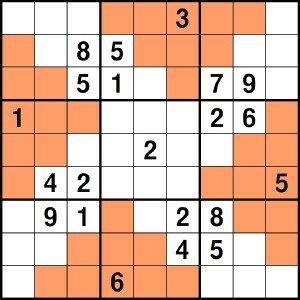 In this variation there are four extra Sudoku regions. 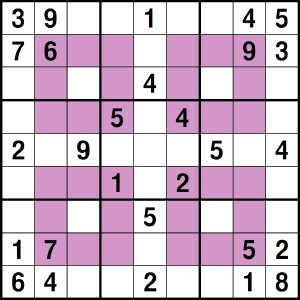 The usual rules of Sudoku apply, and in addition the numbers 1--9 must appear exactly once in each of the four shaded squares. This is an original Brainfreeze variation... BUT we believe it was also independently developed in at least two other places. After all, this is the obvious way to add some extra blocks! This example of Four Squares has difficulty level 2 out of 3. Tip: Use your usual Sudoku strategies, but keep the extra blocks in mind. The most useful information comes from the pairs of cells that are in the same shaded square but do not share a row, column, or block. Here the extra regions are shaped like pyramids. The numbers 1--9 must appear exactly once in each row, column, block, and pyramid. This is an original Brainfreeze variation. This example of Pyramids has difficulty level 2 out of 3. Tip: The pyramids often reveal the numbers in a handful of cells right at the start. Try to incorporate the pyramids into your usual Sudoku scanning strategies. Specifically, notice that each pyramid intersects two blocks. Choose a number inside a pyramid and see if you can use it to determine the location of that number in the other block that the pyramid intersects. Or contrariwise, choose a number outside a pyramid in some block and try to determine the location of that number inside the pyramid. 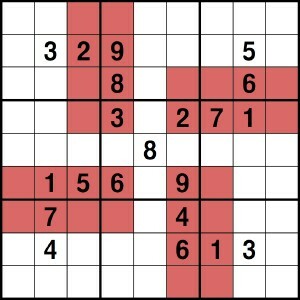 Another variation with four extra Sudoku regions. The numbers 1--9 must appear exactly once in each row, column, block, and stair-like region. This is an original Brainfreeze variation. This example of Stairs has difficulty level 1 out of 3. Tip: Since each stair intersects three blocks, they are more powerful than the pyramids. You will get a lot of mileage out of incorporating the stair regions into your scanning strategies. And yet another variation with four extra Sudoku regions. 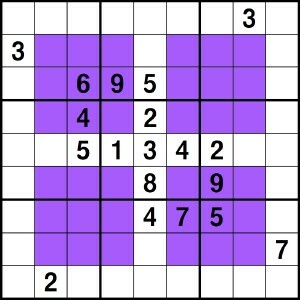 The usual Sudoku rules apply, and in addition the numbers 1--9 must appear exactly once in each staple-shaped region. This is an original Brainfreeze variation. This example of Staples has difficulty level 3 out of 3. Tip: The cells at the inside ends of the staple-shaped regions provide information about a lot of cells in the puzzle, so work on finding the numbers in these cells and use those numbers when you have them. 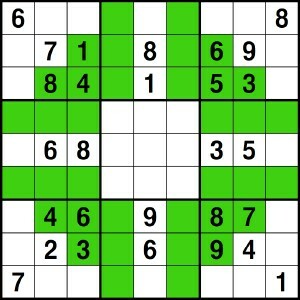 In general, when playing a Sudoku variation with extra "zone" regions, the most useful cells are those cells in the extra zones that in some way go against the grain of the usual Sudoku regions. At first glance, this variation looks much like the ones above, but there is a twist: the extra regions only have eight cells, not nine. 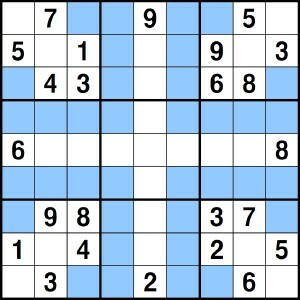 The usual rules of Sudoku apply, and in addition, there are no repeated entries in the shaded rectangles. This is an original Brainfreeze variation. This example of Size 8 has difficulty level 1 out of 3. Similar to the Size 8 variation but with a design in the style of the Four Squares variation. The numbers 1--9 must appear exactly once in each row, column, and block, with no repeated entries in the shaded regions. This is an original Brainfreeze variation. This example of Holes has difficulty level 2 out of 3. Tip: Be careful not to make the mistake of thinking that the value in a "hole" must be different from all of the eight values in its surrounding shaded region. Also, as in the Size 8 variation, it is useful to try to determine which number must be missing from each shaded region.